Less than a week after launch, Anthem is getting a major patch today that seeks to rework much of the underlying problems players have discovered with the game's loot system, and BioWare has already released the patch notes on Reddit. The main point of contention with Anthem's loot relates to its Inscriptions; weapon modifications that can buff player's equipment with stat bonuses and amplifiers. As BioWare itself has noted, however, these Inscription drops aren't always useful to a player's current equipment, as they're tied to specific weapon types. The studio is changing that with today's update, as any Inscription picked up that doesn't affect an equipped weapon will instead provide a bonus to your Javelin, such as increasing your electrical damage output. 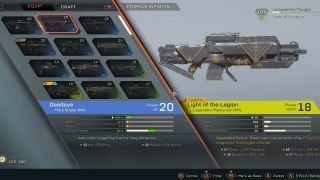 BioWare is also removing uncommon (white) and common (green) items from any loot drops at level 30, making it more likely for high level players to receive better, high tier weaponry during Anthem's endgame, while the threshold for crafting Masterworks has been reduced (from 25 embers to 15) to make it easier for freelancers to grind for specific items. Finally, the Mass Effect Andromeda and Dragon Age: Inquisition studio is tweaking the algorithm on Inscriptions rolls to ensure their variability is tied more closely to specific weapon types. It's a bit confusing, and will only make sense to those who have played enough of Anthem to understand the problem as it stands, but you can read the entire patch notes here if you're interested. Despite a rocky launch, BioWare has promised that its dedicated to making Anthem the best game it possibly can be, with continued patches like these designed to fix some of biggest problems holding it back from greatness. If the speed and sensibility of this update is anything to go by, there may still be hope for Anthem just yet. Check out our best Anthem tips for becoming a freelancer expert in BioWare's multiplayer looter shooter.